Although I've had a lot on my mind to write and share, my health has regretfully been too poor for me to really do so. This being the case, I thought I'd instead show you all a few more recent glimpses into my little world. Each of these photos was taken from bed over the last several months. As you can see, though there's not much activity going on inside, there's a lot going on outside. That last bird (according to my bird identification book) is called a pyrrhuloxia, which is unfortunate, as it sounds more like a disease. Apparently, they are also referred to as gray cardinals or desert cardinals. I wish my photos of this one had come out better, but he was so far away that it was hard to zoom in clearly enough with my little camera. Anyway, it's been sort of interesting to watch the dynamics of all the various birds as they interact with one another. Some (like the woodpecker and curve-billed thrasher) are generally completely unwilling to share the feeder, while other birds (such as finches and cardinals) are typically much more willing to make room for everyone. 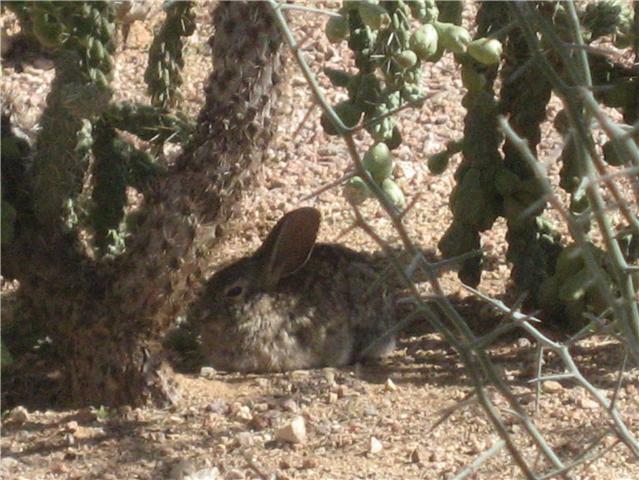 I've yet to see any coyotes, deer or bobcats this year, and for the rabbit's sake, I'm glad of it. I also have yet to see any scorpions or ridiculously huge spiders lurking around and, for my sake, I'm especially glad about that. Mysterious paradox: time, motionless here, gallops out there. In my contracted world, the hours drag on, but the months flash by. Actually, this quote deserves further comment. For those who don't know the story, the author (the former editor-in-chief of French Elle) had a stroke in his mid 40's that left him with a body entirely paralyzed but a mind fully intact. This condition is referred to as locked-in syndrome. In the author's words, it is "like a mind in a jar." The one part of his body that Bauby could move was his left eyelid. Remarkably, he was able to use this single movement to communicate. As a special alphabet was dictated to him, Bauby blinked when he heard the letter he wanted to convey. In this way, slowly and patiently, letters became words, then sentences, and ultimately ended in a memoir. Quite an extraordinary feat. I of course can't begin to know what this man's struggle and experience was like for him. I feel extremely fortunate to still have some movement of my body, even if most of it is in bed. I cannot imagine not even having that liberty. Still, at least to some small degree, I found myself relating to many aspects of his story. My mind, though significantly slowed and exhausted from illness, is full of ideas, aspirations, motivations and observations. And yet, they remain, for the most part, largely unexpressed. My body lacks the ability to free them, or to free even itself. I am locked in, and I want out. In the meantime, life goes on, both in and outside my window. As I lay here persevering, I watch the birds greet each new sunrise in song. They remind me of the beauty around me and of the freedom that lies just within reach. Someday, I will be outside again too, singing my own joyful song along with them. Laurel, I really hope someone can help! I get bedridden a few times a month, but luckily I get good hours here and there. Great photos...it's amazing that when you slow down like we do, how much you can observe. We get a "window" into a whole world many people never slow down enough to see. Hope you pick-up soon. I'm so sorry to hear you are having such a tough time. The pictures are gorgeous, I like the bunny best!! I loved the film 'The Diving Bell and the Butterfly'. What an amazing story of determination, not that dissimilar to yours. Well done on writing another post despite everything that is against you doing so. What amazing things go on outside your window!!! I really enjoyed the photos. Thanks for the lovely photos of your garden visitors and your thought provoking quote. With such a mind as yours and a determination that you have I do hope soon someone comes up with a drug to help you have some serious improvements in your health. So good to read your post, Laurel and see the great photos. I love cardinals...and the gold finches are pretty. The house finch has such a beautiful rust color on its head and breast and you captured that so well. I need to show Joel these photos when he gets home. I am so sorry you are still bedridden with no activity...your courage is commendable, Laurel. I mean that. You are in my daily prayers for healing to begin and be fulfilled in your body. I loved that book, The Diving Bell and the Butterfly. We read it for my book club. Most of the women there hated it; they thought it was so depressing. I was sad for them. Like you, I feel like CFS is a kind of diving bell, and to me it was encouragement to find the butterflies. Do you think it takes a diving bell before you see the butterflies? I think you've inspired me to do some birdwatching. I look forward to the day you write about going outside to take pictures. Seems to me there's an awful lot going on inside! I love to see your pictures. It's amazing what comes to you when you're quiet. I'm sending out positive thoughts for healing. The birds can bring them to you. I love the wildlife pics! I was able to take a few the other day- maybe I will finally upload them today. I'm sorry that things have been so low for you lately- warm thoughts and hopes to you! It's wonderful to see a post from you, Laurel. I'm so sorry things are rough. I'm bedbound much of the time too and I do the same thing: watch birds outside my window! Thanks so much for sharing the pictures of them with us. I love the fact that we can be so close to wildlife with birds. It's a discovery I made since becoming sick: wild birds! I found you via Sue's blog, and am glad I did. What good energy and what a creative spirit. The pics are great! I too was bedridden in the beginning, and I had no help raising my then young girls while their dad was at work. Wow, things can get better! Hope you'll find my blog! I found your blog a while ago, but haven't had time to read through much of it until recently. I really admire your positive attitude, clinging onto your dreams despite the severity of your ME - I hope that one day they will all be realised. My ME is on the mild side of moderate, but I have severe MCS, which is limiting in a different way - I am very mobile (for someone with ME) but there are a lot of places I can't go. Like you, I watch the birds and wildlife in my garden ... completely different ones (I'm in the UK) - so it's lovely to see yours! The pyrrhuloxia does indeed look very cool, and I love the cardinal - such a glorious colour. I hope your health improves soon. Laurel, I also love to sit by the window and watch the birds. I also enjoy seeing all the neighbors out walking their dogs in the evening. The bird pictures are beautiful. Hope you feel a little better tomorrow. Thanks, everyone. I appreciate all the kind comments, as always! Laurel, your spirit is amazing. How you can find as much positiveness as you do within your own "4walls and a view"" inspires me. I loved your photos. Unlike most of your commenters, the one that grabbed me was the Hawk. Now that is something you don't often see! You know something that I thought of when I was viewing your photos. If it wasn't for the fact that you are bed bound because of CFIDS, you would never capture some of those shots. The fact that you are there for long periods 'stalking' the prey (he he) allows you to capture amazing 'moments.' Maybe you might consider putting together a book of your photography. Sending you lots of hugs and prayers. I wish I still lived in Phoenix so I could come by and visit with you once in a while! I love your pictures & I love the observation that birds eat like pigs--we have the same experience w/ feeders here. as always, thinking of you & sending lots of positive energy & hope that you'll be out there singing with the birds soon. much love to you, friend.